Posted September 18, 2013 by Omi Prive & filed under Custom Collection, Omi Privé, Pink Tourmaline, Signature Collection, Spessartite Garnet, Topaz, Trends. Autumn marks three of my favorite things: the transition to a new wardrobe (bring on the boots, chunky sweaters, and cozy scarves), the infamous Fall drinks (who can live without pumpkin spiced lattes and chai tea? ), and the very best – new jewelry! From light pastels to warm neutral tones, softer colors are everywhere, especially in fine jewelry. I have spotlighted five Omi Privé favorites below. Not only do these accentuate the near transitions to Winter, but each is truly a year-round investment piece. 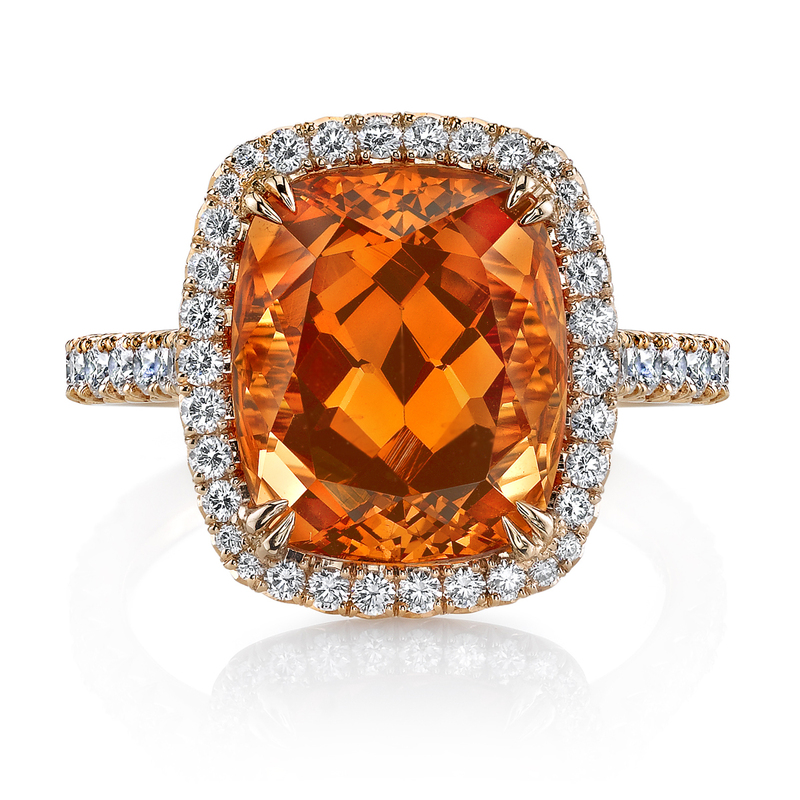 This ring boasts an 8.66 carat cushion-cut spessartite garnet center. 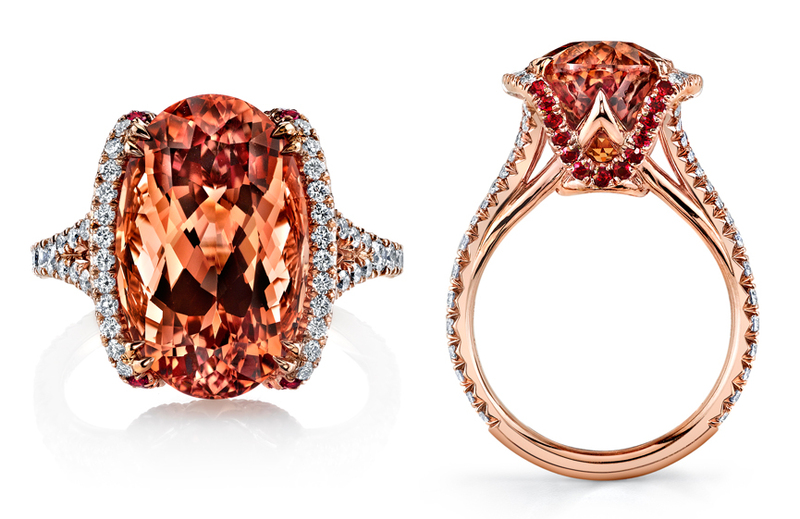 The 18K rose gold setting compliments the gemstone’s rich orange color. Bright and beautiful, this garnet exudes the idyllic tone for Fall, and will add a brilliant “pop” of color to a year-round wardrobe (Style RC1012-SGCU). Handcrafted in Platinum, these stud earrings feature two round garnets weighing a total of 1.43 carats. 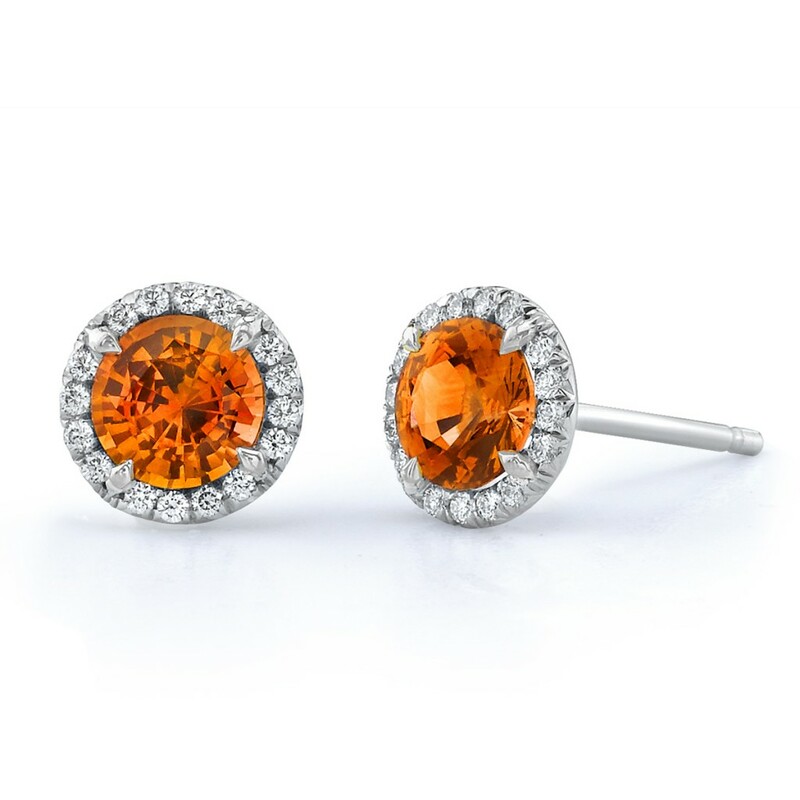 The orange spessartite centers are accentuated by the pavé-set diamond halo frames. These studs are stunning, yet effortless, for everyday Fall wear (Style SS1050-SGRD). The 6.22 carat spessartite garnet in the center of this pendant was mined in Nigeria. It presents optimal color, not reflecting any excess brown or yellow. The Platinum design features a double halo, with small round spessartites set in the inner 18K rose gold frame. 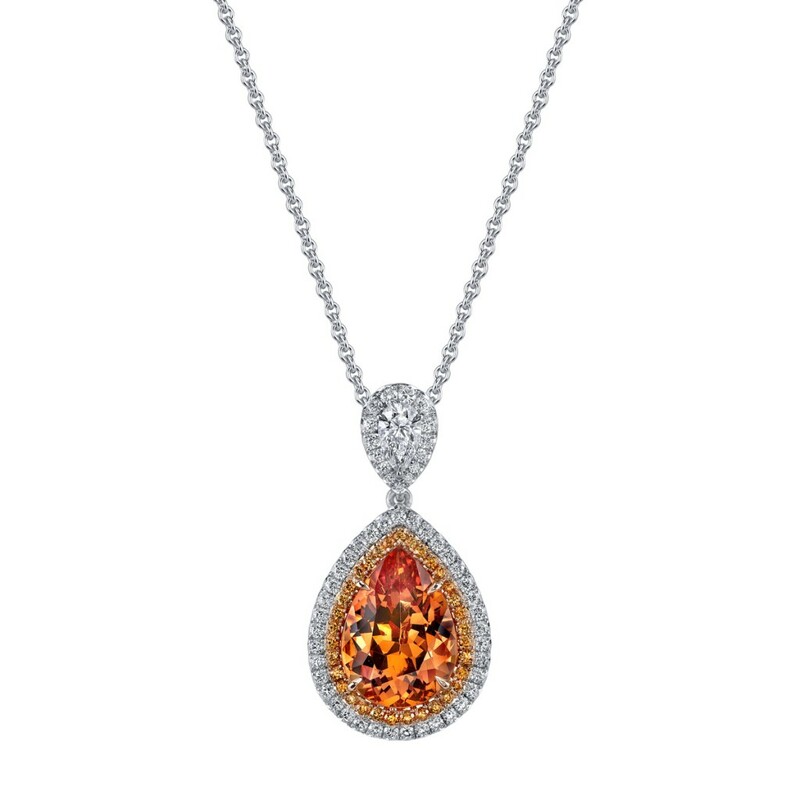 White diamonds add contrast, and also emphasize the garnets’ vibrant orange color (Style PC1110-SGPE). 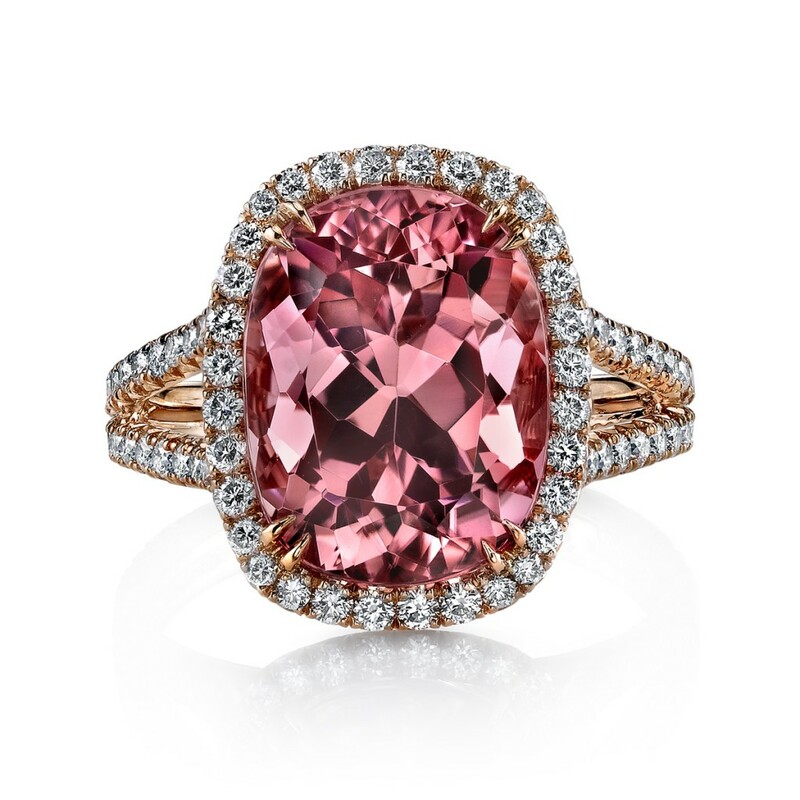 This ring features a 6.72 carat cushion-cut pink tourmaline center. The piece was specially created in 18K rose gold to flawlessly frame the stone, and highlight its hue. The combination is perfect to accentuate Autumn’s warm tones, and the color transitions beautifully to Winter, Spring and Summer (Style RC1230-TPCU). This 11.11 carat topaz was mined in Ouro Preto in the state of Minas Gerais, Brazil. Its fine golden-yellow hue is known as Imperial color. The stone ideally reflects its trichroism, with its noticeable red shades able to be seen from the sides. To bring out this feature, the 18K rose gold setting was specifically crafted with small round rubies set on both sides bordering its frame (Style RC1450-PTOV). Which piece is your favorite this Fall? Posted April 10, 2013 by Omi Prive & filed under Custom Collection, Fancy Sapphire, News, Omi Privé, Pink Sapphire, Pink Tourmaline. Enjoy the Rose without the Thorns! Posted March 28, 2013 by Omi Prive & filed under Custom Collection, Fancy Sapphire, Omi Privé, Pink Sapphire, Pink Tourmaline. A great amount of time has elapsed since my last entry; however, this is due to a hectic (and exciting) start of the year! From aiding in the selection of loose gemstones at the AGTA Gem Fair in Tucson to contemplating new design ideas with our head designer, Niveet Nagpal, I have enjoyed every minute of placing up-and-coming pieces into Privé production! While I cannot wait to reveal all of the exciting additions to the line in the next few months, for now, I would like to address a subject that is definitely noticeable in the fashion – and retail – sector: the reemergence of rose gold. It is true that mixed metals has been an ongoing trend, represented in all facets of the jewelry industry – from costume to couture. Whether worn alone, or used with other tones of gold in mixed-metal pieces, rose gold has certainly carried a strong presence into 2013. In the last nine months, the industry has seen the reentry of this tinted metal that has conveniently managed to subside over the decades, but has definitively resurfaced. Rose gold first gained popularity in the beginning of the nineteenth century in Russia, and was earmarked at the time as Russian Gold. It became popular in the United States in the 1920’s. With the use of copper as the main alloy, this gold mixture gained its name from the pink hue it emanates. Like most women, I love rose gold. There is a warm quality about the metal tone that makes it different enough to be unique, but still valuable and classic enough to withstand capsizing trends. It is perfect for today’s high jewelry consumer, who seeks individuality without compromise of quality. Omi Privé customers epitomize this. Many new pieces in the Omi Privé collection have been designed entirely in 18K rose gold, as it ideally compliments pink and orange gemstones, from fancy colored sapphire and spinel to fine rubellite or spessartite garnet. A recent piece that received noticeable attention at the AGTA Gem Fair is this 18K rose gold French-pavé ring. 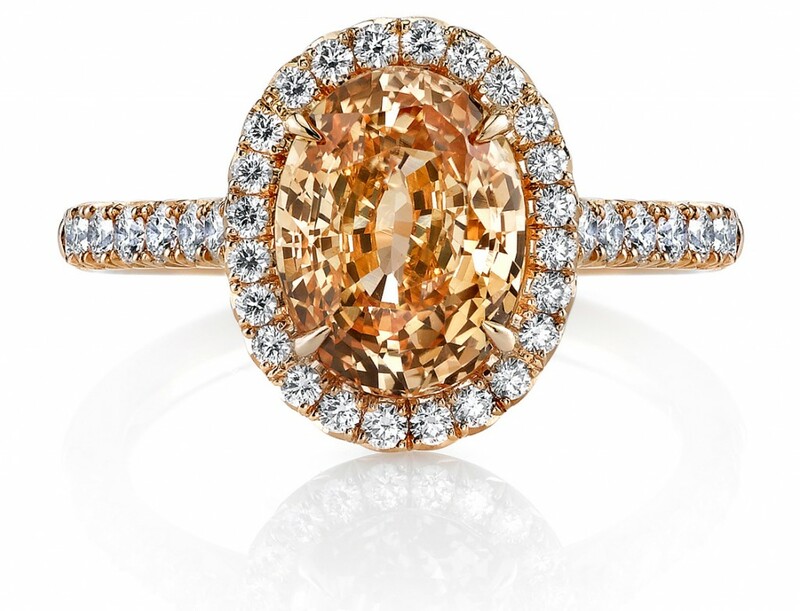 While simple in its design, the rose gold setting provides the precise rendition of color to highlight the stunning 3.56 carat orangey-yellow sapphire center. 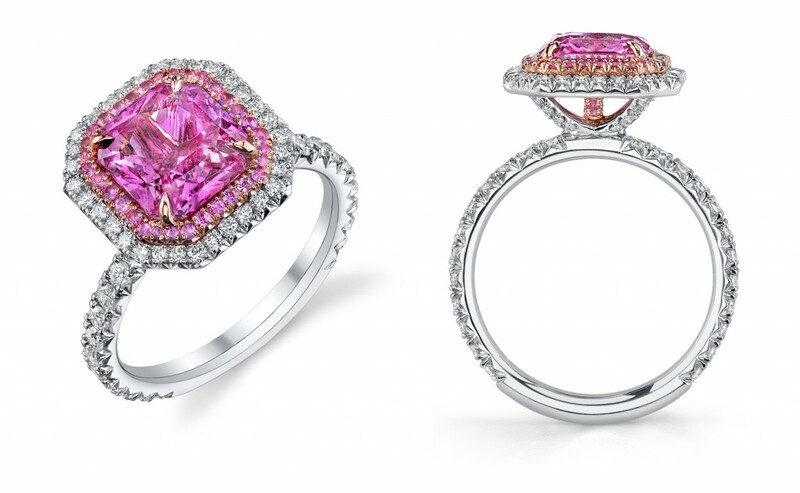 We are also excited to reveal several Omi Privé “Signature” designs with pink sapphire centers. 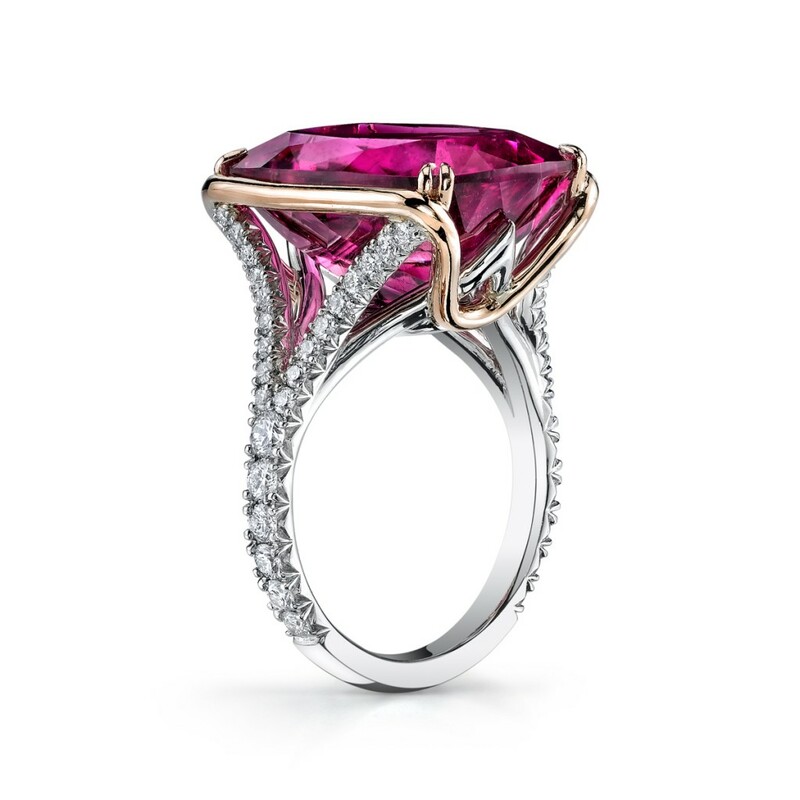 The staple “Signature 1” ring in 18KR offers the idyllic setting to highlight a round pink sapphire. 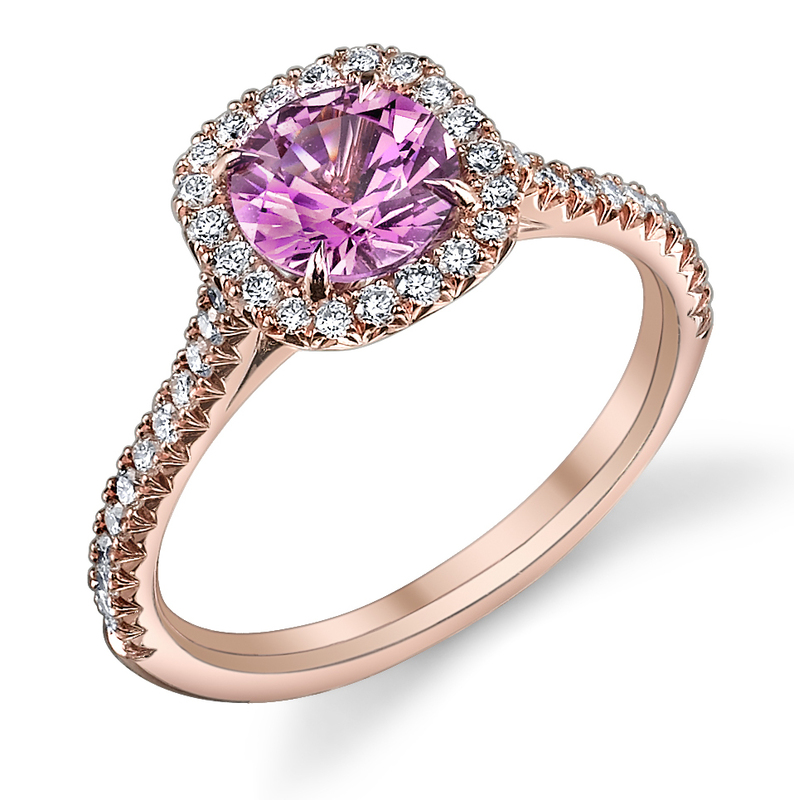 Notably, the Omi Privé 3-stone pink sapphire ring in rose gold has entertained great acclaim as a finalist in the 2013 Jewelers’ Choice Awards. This design has been so popular, we have had a difficult time keeping one in stock! Rose gold can also be spotted as an accent metal in several Omi Privé fine Platinum pieces. 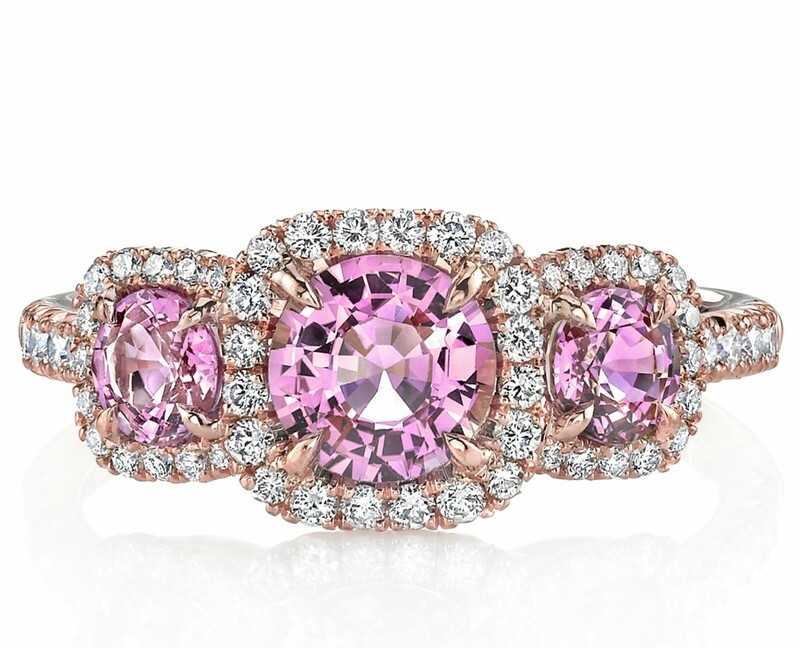 Check out the inner pavé-set halo and basket in this stunning Platinum ring, which flawlessly surrounds the 3.14 carat radiant-cut pink sapphire center. Lastly, one of my personal favorites is this Omi Privé stunner, which includes an 18K rose gold border that truly makes the 15.16-carat cushion-cut rubellite center pop! The epitome of a showstopper, this ring absolutely portrays the use of rose gold in all of its refined and timeless style.To choose your own Omi Privé rose gold design, please contact one of our Authorized Retailers for pricing and information.